Thanks to a grant from the Heritage Lottery Fund, Westminster Community Reminiscence and Archive Group have been able to create this documentary film: Towards a New Jerusalem to mark the 70th anniversary of the NHS, an institution we all hold dear. It was made by children from Y6 at Servite Catholic Primary School. Twelve children were trained in film making and oral history techniques by Matt Rosenberg and Sav Kyriacou of Digital Works. They interviewed retired doctors and nurses at the Royal College of Nursing in May 2018. 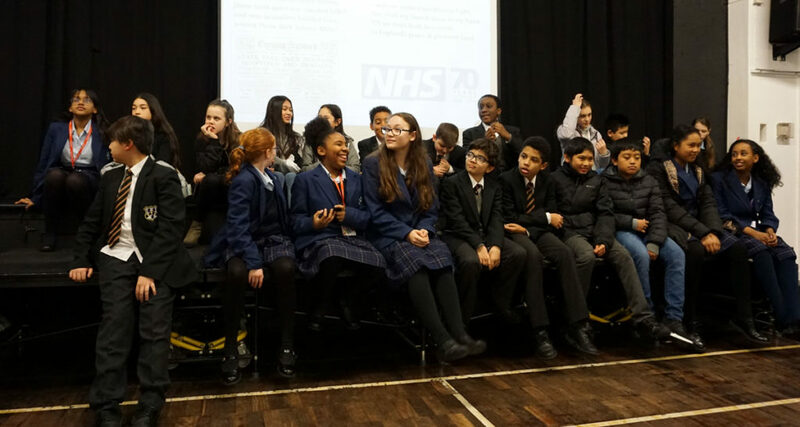 The aim was to get their interviewees to discusses the origins of the NHS and the influences the war and politics had on it. We hope you enjoy the film that showcases the stories of those who helped to create a national institution. The Doctors to the Nurses! The launch screening took place at Servite Primary school on Thursday 24th January 2019 with many of the now Year 7 film-makers returning to their primary school, along with parents and interviewees to watch the film. You can watch the film here.